Home Crepe Blog February’s Here, and Love is in the Air! February’s Here, and Love is in the Air! Despite the cold temperatures, February’s all about warmth for friends and family! Spend some time with loved ones… take your sweetheart out on a special date for Valentine’s Day, and then take advantage of Family Day to hang out with your family for a long weekend. Read on to find out more about these special holidays, and of course learn more about our treat of the month! Family Day, which always falls on a Monday, is a public holiday designed to give family members an extra long weekend to spend quality time together. Take the opportunity to enjoy some outdoor fun like skiing or skating, or – if it’s a bit too chilly – stay inside and play some cards or even research your family history! This year, Family Day is celebrated on February 11th in British Columbia, and on February 18 th in the provinces of Alberta, Ontario and Saskatchewan. The most recognized February day is of course the 14th, Valentine’s Day! It is a special tribute to romantic love – a day when couples celebrate their relationship by giving gifts such as beautiful bunches of red roses, heart-shaped boxes of chocolate, or even a shiny piece of jewelry. Presents aside, remember that showering your loved ones with kisses and hugs is the best way to celebrate…. xoxoxo! And now for something a little bit different… if you’re a chocolate fan, there’s one more, slightly nutty, reason to celebrate in February – World Nutella Day! Check out the website, and unite with your fellow Nutella lovers to drool over the newest Nutella recipes, and even learn how to say “Happy Nutella Day” in multiple languages! 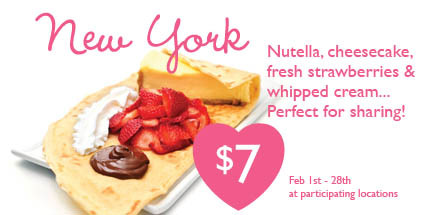 This month, our chefs have lovingly created the “something”, perfect for sharing… the New York crepe. Think New York cheesecake, nutella, fresh strawberries & whipped cream! And if that doesn’t tickle your fancy, keep in mind that you don’t have to go to a Crepe Delicious creperie to satisfy your craving. You can get your very own crepe machine, or take advantage of our catering service – you and your friends and family can enjoy our amazing creations at your private event. We’ll even have our Executive Chef create a signature crepe especially for you! We’ll come to your venue with our crepe makers or crepe cart, and a bounty of fresh ingredients to make your event a success. Click here to learn more, and take a peek at our list of our delighted clients.